Zaun’s HiSec Plus is a double wire, anti climb fencing system for high security applications. Using the popular ‘358’ welded mesh configuration to repel thieves, trespassers and intruders. 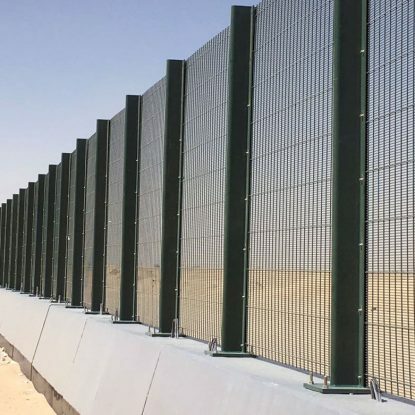 The HiSec Plus attributes make this system an excellent solution for high security applications as the combination of increased vertical wire diameters and double horizontal wires on the rear every 254mm provide a rigid and visually appealing option to the standard HiSec range with the maximum strengths and security . The close-mesh configuration ensures that the HiSec Plus system is difficult to climb and also highly secure. Using our DualFix clamp bar system, HiSec Plus can work to mitigate the risk of potential attack. For high security sites, the panel is flat against the post and the panel ends are held against the post by a front plate which makes levering the panels off very difficult. The HiSec Plus system is available in single panels of up to 5.2 metres in height and 2515mm in width. To ensure we are able to supply a complete, single solution, pedestrian and vehicle access solutions have also been carefully designed to address both aesthetic requirements along with ensuring the same security level of the mesh is maintained. Also ideal for integrating with CCTV, PIDs and security topping enhancements such as barb and razor coils, all supplied as part of a complete turnkey solution. Pedestrian gates are single leaf 1.2m wide, (or width to suit). Framed in a 100mm x 50mm RHS with Zaun HiSec Plus mesh bolted to the frame, with slide latch. Each gate features a rubber bump stop and also 2 x suitable gate posts. Vehicle access gates are double leaf (single leaf vehicle gates available) 3.0m wide (or width to suit). Framed in 100mm x 50mm RHS, with Zaun HiSec Plus bolted to the frame, with drop bolts and slide latch. Each vehicle Gate features a rubber bump stop and also 2 x suitable gate posts. Samples of Zaun HiSec Plus are also available upon request, to request your free sample please click here.